If you have been waiting to get involved, looking for that opportunity to sign up, seeking out a way to make a difference… THE TIME IS NOW! With our Legacy of Champions Marching Band Competition less than three weeks away… WE NEED YOU more than ever! Yes, YOU… our Trojan Nation students, alumni, family, friends, staff, faculty, and community supporters. So please look at all the opportunities below and see how you can make a difference. As we continue to prepare for the Legacy of Champions that takes place on October 13, 2018, we desperately need you to get involved! We also need your help with ATVs, golf carts, trailers, and fulfilling volunteer duties the day of the event. Please see below for details about each need. These motorized vehicles & trailers will be used for hauling the equipment for the various bands that will be performing at the competition. We can use either four wheelers, utvs, etc. These vehicles will need to have a trailer hitch for pulling a trailer. We are in need of 10-12 or more of these vehicles. The golf carts will not be used to pull trailers but rather used by staff in the performance of their duties. We are in need of 4 or more of these vehicles. We also need trailers to place the equipment on. These will need to have a ramp that can be lowered. The size we can use would be 6′ wide by 12′ or less long, due to restrictions of gate sizes at the stadium. We are in need of 10-12 or more of these as well. Finally, we will also need tables, tents, and turkey fryers to round out our vendor area. Did you know that volunteering at the Legacy of Champions is actually expected of all of our boosters/parents? This event is such a huge undertaking and is becoming one of our top fundraisers, with proceeds going to reduce the cost of future band trips for all students. This allows us to consider more extravagant trips and for more students to go. All band students are required to work the entire day and parents/band boosters are expected to work at least one volunteer shifts during the event, but highly encouraged to commit to working the whole day. The success of our event takes the support and efforts of ALL of our parents/boosters. So please take a moment and visit our volunteer page: https://chstrojanband.com/volunteer/ and review all of the various sign-ups available for the event. There is a large variety of volunteer positions available, from staffing gates and ticket booths, to being a parking attendant or traffic control. Or how about working concessions, working a fryer, or just serving as a general volunteer. There is something for everyone! The most important part is to just be involved, so please take time to sign-up today! THE TIME IS NOW! This important meeting will cover some general band booster items as well as final preparations for the Legacy of Champions. 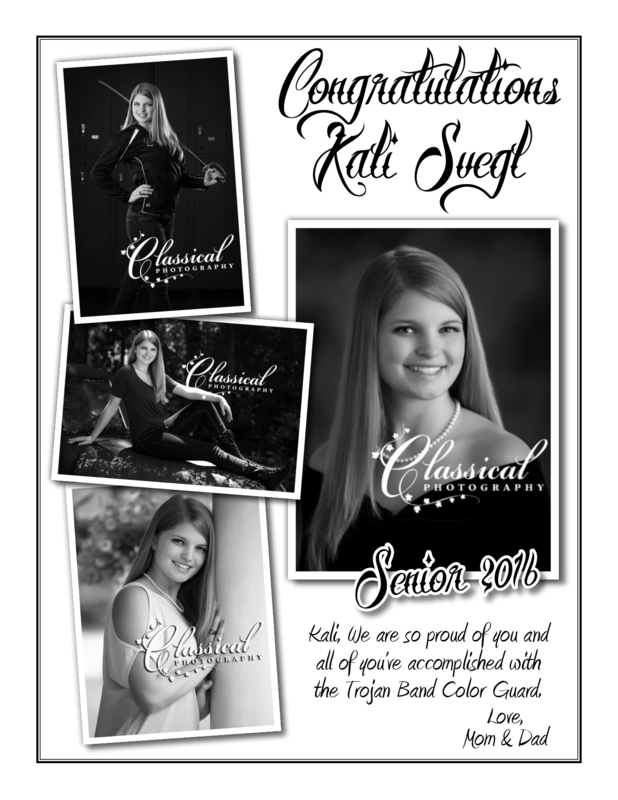 Posted in CHS Band and tagged #trojangold, #trojansallin, Carrollton High School, Carrollton High School Band, Carrollton Trojan Band, Carrollton Trojan Band Boosters, CHS Band Program, CHS Trojan Band, Gold Standard, Legacy of Champions, Marching Band Competition, Trojan Band Boosters on September 25, 2018 by CHS Trojan Band. How Will You Make A Difference This Week? Thank you to all of our volunteers this weekend! Although Friday night was wet and dreary, your help made it enjoyable. Thank you for everyone who showed hospitality to Villa Rica and for your flexibility with the weather. Saturday was very successful because of our parental support as well. We were able to finish the drill, make great progress on the props, feed our students quickly, and restore our uniforms from the night before! Let’s pray for great weather this week! The forecast is for it to rain some this week, we will rehearse rain or shine. Pack a poncho just in case. Friday – Away game versus Rome – BRING A SHAKER – Let’s be LOUD!!!!!! IMPORTANT REMINDER for picking up your student after the game!!! Please remember that NO cars should enter the band parking lot UNTIL the buses and 18 wheeler have pulled in and the students have safely unloaded. ALL students are EXPECTED to unload ALL equipment, not just their own instrument! If everyone helps, we will accomplish the work faster and we can all get home! Thank you for your help! The kids appreciate it! We take waters to every game and competition, so we need LOTS of water! Our competition, the Legacy of Champions (10/13/18), will be here before you know it and we need to make sure we get all of the volunteer spots filled. If you haven’t signed up yet, please do so as soon as possible so we can continue to prepare knowing this is all taken care of. Remember, all band students are required to work the entire day and parents/band boosters are expected to work at least one volunteer shifts during the event, but highly encouraged to commit to working the whole day. The success of our event takes the support and efforts of ALL of our parents/boosters. So please take a moment and visit our volunteer page: https://chstrojanband.com/volunteer/. The most important part is to just be involved, so please take time to sign-up today! There are also sign-ups for donating food and lending equipment! 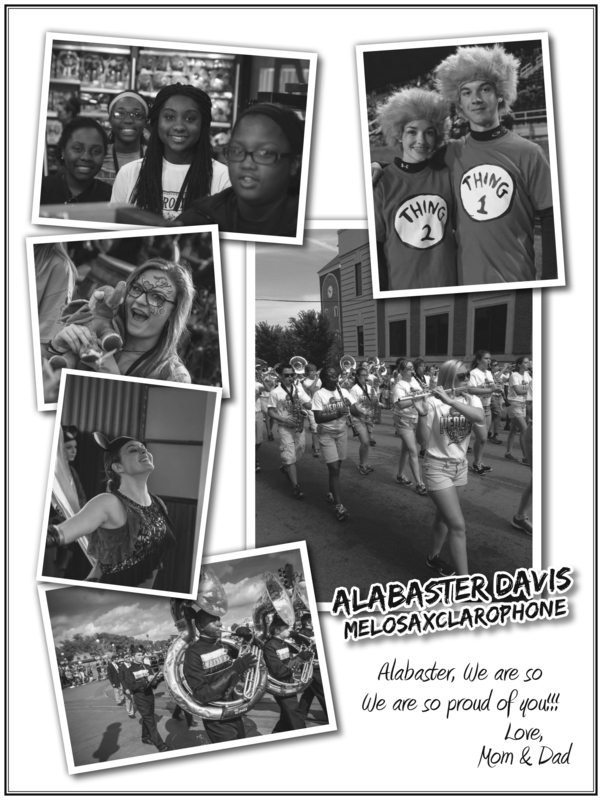 Don’t miss out on a opportunity to make a huge impact for our band! The 4th and final payment deadline is quickly approaching, October 23rd. This is a very important deadline! Our contract with the travel company states that all travelers must be completely paid by this date! Balance ​DUE BY October 23, 2018 **Payments may be made with an organization check, cashier’s check or money order. Credit card payments may be made with our online web link with MasterCard, Visa and Discover. Cancellation/Changes – items for the trip have been purchased, which is why this policy is so important. Posted in CHS Band and tagged #Hollywood2018, #Hope, #trojangold, #trojansallin, Carrollton High School, Carrollton High School Band, CHS Band Program, CHS Trojan Band, Gold Standard, Legacy of Champions, Marching Band Competition, Trojan Band Boosters on September 9, 2018 by CHS Trojan Band. If you ordered a show shirt, they will be ready for pick up TODAY from 8-9 pm in the band room. Home game versus Villa Rica – BRING A SHAKER – Let’s be LOUD!!!!!! There is a FULL band rehearsal THIS Saturday from 1:00 – 9:00 pm. The band boosters will be serving Chick-fil-A to the kids for dinner. We will have another prop building day this Saturday from 9:00 am – 5 PM. As we continue to prepare for the Legacy of Champions that takes place on October 13, 2018, we wanted remind you of how you can get involved and provide additional support in other ways. We also need your help with ATVs, golf carts, trailers, food, and fulfilling volunteer duties the day of the event. Please see below for details about each need. Our competition hosts one of the best hospitality rooms in the state! We do this by spoiling our guests rotten with comfortable surroundings, Southern hospitality, and great food! So to ensure we continue this great tradition, we need your help with the “great food” part. Please visit this sign-up: https://www.charmsoffice.com/charms/volunteerR.asp?s=carrgahsb&v=4451293 and volunteer to help out with this need. The success of our event takes the support and efforts of ALL of our parents/boosters. So please take a moment and visit our volunteer page: https://chstrojanband.com/volunteer/ and review all of the various sign-ups available for the event. There is a large variety of volunteer positions available, from staffing gates and ticket booths, to being a parking attendant or traffic control. Or how about working concessions, working a fryer, or just serving as a general volunteer. There is something for everyone! The most important part is to just be involved, so please take time to sign-up today! Posted in CHS Band and tagged #12tothemoon, #trojangold, Carrollton High School, Carrollton High School Band, Carrollton Trojan Band, Carrollton Trojan Band Boosters, CHS Band Program, CHS Trojan Band, Gold Standard, Legacy of Champions, Marching Band Competition, Trojan Band Boosters on September 6, 2018 by CHS Trojan Band. The sun never made it through he clouds on Saturday as the third edition of Legacy of Champions Marching Band Competition unfolded on the campus of Carrollton High School but the talent sure shined all day! Saturday was the culmination of months of preparation, not only by the Legacy staff and volunteers, but also by the outstanding bands that took the field in competition at Grisham Stadium. It was evident by the end of a wonderful day of music, food, smiles, and entertainment that everyone’s hard work had paid off, with the competing bands rising as the true stars of the evening. The event, which took place on the gorgeous 130-acre campus of the Carrollton City School system, within historic Grisham Stadium, featured 21 performances by local and regional bands. the huge crowd of supporters and marching band enthusiasts that gathered were treated to amazing performances, a variety of vendors, concessions, and first-class facilities that helped to ensure an enjoyable day for all in attendance. The evening concluded with a greatly anticipated awards ceremony, highlighted by the presentation of our massive, one-of-a-kind, traveling Grand Championship Trophy, The Legacy Sword Trophy. At the end of the evening, the Legacy Sword Trophy was awarded to the Pope High School Marching Band of Pope High School, located in Marietta, Georgia. In addition to being named the Grand Champions, Pope also received the prestigious Don Hall Music Award. 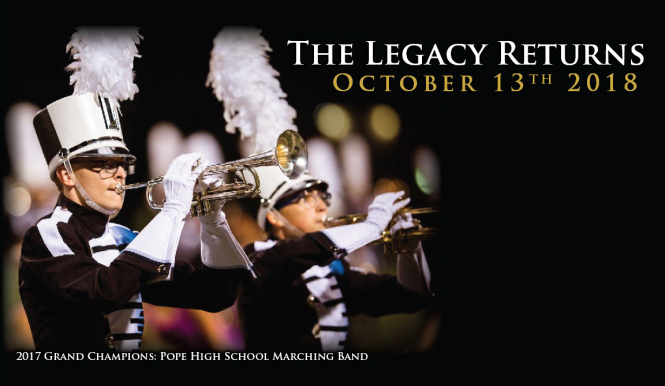 Congratulations to all of the students, staff, boosters, and supporters of the Pope High School Marching Band for their remarkable success at the Legacy of Champions Marching Band Competition. We would also like to say a big thank you to all of the Carrollton community for your overwhelming encouragement and support. In addition, thank you for the herculean efforts of our event staff and volunteers. Posted in CHS Band, Legacy of Champions and tagged #trojangold, Carrollton High School, Carrollton High School Band, Carrollton Trojan Band, Carrollton Trojan Band Boosters, CHS Band Program, Gold Standard, Legacy of Champions, Marching Band Competition on October 15, 2017 by CHS Trojan Band. Band Signing Day May 7, 2019 at 2:30 pm – 6:46 am Senior Signing Ceremony in the Band Room. For seniors and their parents.